Volkswagen used the Detroit Auto Show this week to introduce its revamped 2020 Passat sedan. There are few major changes in the Passat as VW has decided to return to its roots by working on incremental changes to its vehicles. The Passat certainly exhibits this. 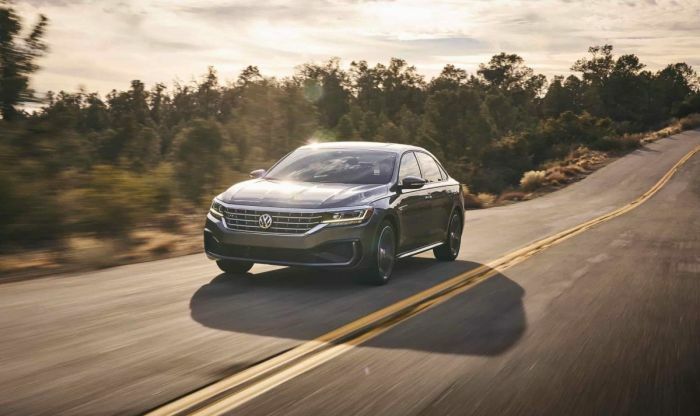 The 2020 Passat is conservative, using an older platform, not the automaker’s MQB underpinnings. The 2020 model has pleasant fastback-style lines. The standard wheels are 17-inch alloys, while the new LED headlights do add zip. When it debuts later this year, the Passat will be available in five trim levels. The line does include an R-Design appearance package that features 19-inch alloys and some other sporty outside design cues. The Passat carries over last year’s 110-inch platform. Because it does, Passat’s interior dimensions remain the same. On the inside, Passat features a low dashboard. The infotainment system uses a 6.3-inch touchscreen. It includes Apple CarPlay and Android Auto compatibility as standard. Depending on the trim level, the interior upholstery choices range from cloth to synthetic leather or Nappa leather. Top line models include power-adjustable driver seats, heated front, and rear seats and dual one climate control. The audio system carries the Fender brand. Special thanks to VW for making the literally most anemic 2.0 turbo on the market. Not sure how they accomplished this, but there are 2.0L 4 cylinder engines, normally aspirated, with more HP, such as the Subaru BRZ, and the Mazda Miata. Heck, the upcoming Toyota Corolla with its new direct injection 2.0 as an upgrade is slated for 169 HP which is only a little lower than this Passat. Not sure why VW even wasted their time putting a turbo into it with those lackluster numbers.